Such a lovely benediction, and the wine certainly did all that and more. But it left a residual sadness as well, that the very principles so clearly expressed no longer apply. Family wineries are hard to maintain from generation to generation given the tax laws, and the Mondavis made some terrible business decisions. But I will forever mourn their loss. 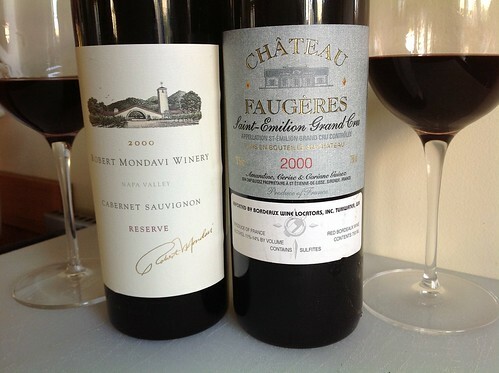 The second bottle was a Chateau Faugères Saint-Emilion Grand Cru. I don’t recall where I obtained this wine, or what I paid for it. A look at the CellarTracker website turned up some very current reviews, to my surprise. Just in the past year, here are some of the comments that were made about this wine. Tasted by Sundbyberg on 8/8/2012 & rated 91 points: Nose of ripe fruit. On the palate very fruity, but not close to being jammy or too sweet. Elegant, close to very elegant, and smooth yet powerful and very focused. Medium to full body. This wine is very good. 89-92 pts. Tasted by khmark7 on 6/11/2012 & rated 91 points: Very very good. Elegant with herbal notes, all in balance. 2000 is still the best vintage of the last decade in my opinion. Tasted by Ridgerunner on 6/2/2012 & rated 91 points: This wine would have been just fine to drink for another 5-10 years! Tasted by KSWinegeek on 5/22/2012 & rated 91 points: Dark, balanced, soft and delectable. At a very nice place right now. Tasted by S2 on 5/12/2012 & rated 89 points: A nice wine with nicely integrated tannins and a pleasant but somewhat restrained nose. Typical middle of the road St. Emilion in character and weight. I will be drinking the rest of these wines sooner than I anticipated…within the next 2-3 years. Tasted by welchcellars on 2/11/2012 & rated 90 points: Oak and spice dominate this generous wine. Dark and full, it's a Bordeaux from a great year that seems to have hit its stride. I would look to drink it within the next 3 years. Tasted by Didman on 1/9/2012 & rated 90 points: Really a lovely bottle. Soft and silky with a deep purple color and lovely aroma. Better than the last bottle opened. I would have to agree with the general consensus here. The wine was drinking at or near its peak. It was soft and mellow, with mature fruit flavors and a broad, lightly spicy palate. In fact both of these wines were surprisingly similar. For the first half hour or so, I gave the nod to the Mondavi, which seemed to show more power, more fruit, and just a light hint of leather. But as the evening wore on and the Bordeaux breathed into life, it gained complexity while the Mondavi seemed to thin out just a bit. Bottom line – it was the right time to drink them both. You could leave them alone for another five years or more, but I don’t believe that they would improve. As for the occasion? It was exactly seven years ago to the day that we took possession of the little falling-apart shack in Waitsburg that would ultimately become our much-loved cottage. I have to say that for the past couple of hours I have been hooked by the amazing articles on this site. Keep up the great work.